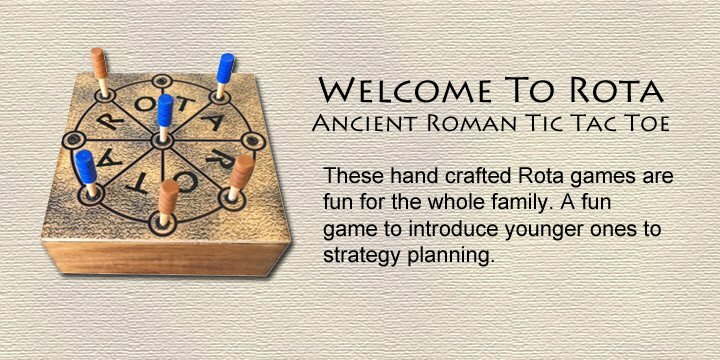 ​The ancient Roman game of Rota is easy to learn, quick to play. It makes a great kid's game that teaches planning ahead and the points of the compass. We don't actually know the Roman name for it, but scholars call it Rota, Latin for "wheel." 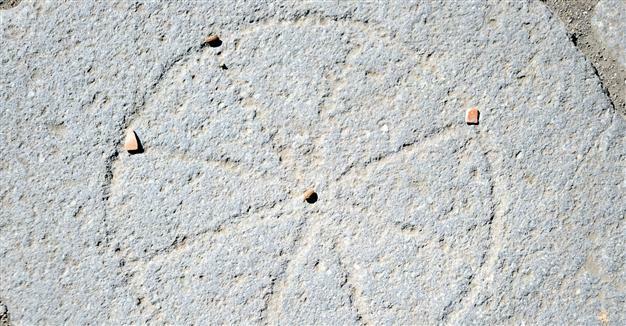 Rota boards were painted, scratched or scribbled everywhere that Romans went. It probably kept a lot of bored Roman soldiers busy. Scholars guess that Rota is a three-in-a-row game like tic-tac-toe. They have reconstruted the rules based on medieval games that look a lot like it. Just like tic-tac-toe? Not so fast! Rota can never end in a tie. First, draw a circle. Draw a plus sign in it (+) and then an X. Draw dots at the end of each line and in the middle where they coss. Now you'll need pieces. You can use coins (different coins for each player), buttons, pebbles, or anything you like.